THE DEATH of five Indian nationals among the 50 killed in the Christchurch terrorist attack has brought into focus another set of numbers that reveals how New Zealand is increasingly becoming an attractive destination for visitors from India — they add up to a 93 per cent hike in the last four years. Known for its beautiful locales, quality of higher education, low corruption and clean air, New Zealand has a population of 47 lakh of which around 2 lakh are Indians and those of Indian origin. But it’s the number of Indians visiting the country that’s telling. According to data available with the New Zealand government, 34,672 Indian nationals visited New Zealand between September 2013-October 2014. This number has since increased steadily and now stands at 67,072 between September 2017 and October 2018. While 70 to 80 per cent visit New Zealand for vacationing, and visiting family and friends, the remaining 20 per cent is linked to business, education and conferences. The data also show that India is the second largest source of students to the country — after China — with over 30,000 Indian students. And in 2018, India was ranked ninth among the top 10 countries in terms of visitors to New Zealand, which includes all nationalities. Australia, China and the US were the top three “source countries”. New Zealand is a hot destination for Indians. Students go there for high-quality global education,” says Deepali Patel, a licensed immigration advisor for New Zealand. “Comparatively, I have to use the word comparatively after the latest incident in Christchurch, it is a very safe and peaceful place. For girls who travel alone, it is very safe. There is no racial discrimination there,” she says. 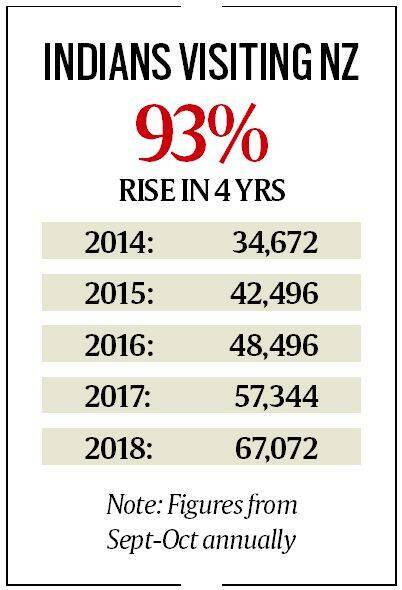 The number of students, however, has dropped in the last few years, particularly in the second half of 2016 and in 2018, due to tighter rules and monitoring of student visa applications from India. According to Patel, New Zealand “wants high quality students”, and it is offering a good deal for those who want to do their Masters and PhDs. “The spouse gets work visa, and a child above 5 years is treated as a domestic student, which means that its education is almost free,” says Patel, who was earlier with the New Zealand High Commission’s visa section. Rajni Garg, another New Zealand government-licensed immigration advisor, says that before the year 2000, New Zealand was not high on the radar. “The Bollywood movie, ‘Kaho Na Pyaar Hai’, which was shot in New Zealand, changed that. After that, tourists started going there,” Garg said. “There is clean air, no crowds, only sheep and cows if one drives for miles, so there is solitude. And it is very immigrant-friendly. I recently came across a well-off Delhi-based businessman, who wants to migrate since his children are suffering due to air pollution,” says Garg, who was also with the High Commission’s visa section. In 2016, New Zealand was ranked second in the Ease of Doing business index, and in 2018 was ranked the second least corrupt country in the world according to Transparency International. It also ranks first in political freedoms, according to international rankings. So will the Christchurch attack have an impact on visitors from India? “I don’t think so,” says Patel. “In New Zealand, volcanoes and earthquakes are an issue. Terrorism is not. This is not the Kiwi way, they will move on,” says Garg, adding that her children are settled there.